In years past, the giant known as South By SouthWest would dominate my friends and I’s schedules – we’d spend weeks RSVPing to parties, checking our spam folders for any missed confirmations and making sure our most looked forward to artists had open tour dates – in those days, that would inevitably mean they’d be playing the festival for sure/without a doubt. As a longtime Austin resident March was one of the months that brought me joy to have so many friends visiting to witness the unique and spontaneity nature that SX brought every year, but after moving in 2014, I hadn’t thought of the event much at all. In the years that have followed, that tragic event still looms in the background of my thoughts, so I was a bit surprised to find myself booking a flight and catching a last minute SXSW reunion with friends. In the end what won me over was that I had missed the musical melting pot of SX and I missed Austin most of all. With a few parties on my agenda, I set out for my old city and came away with some new gems. 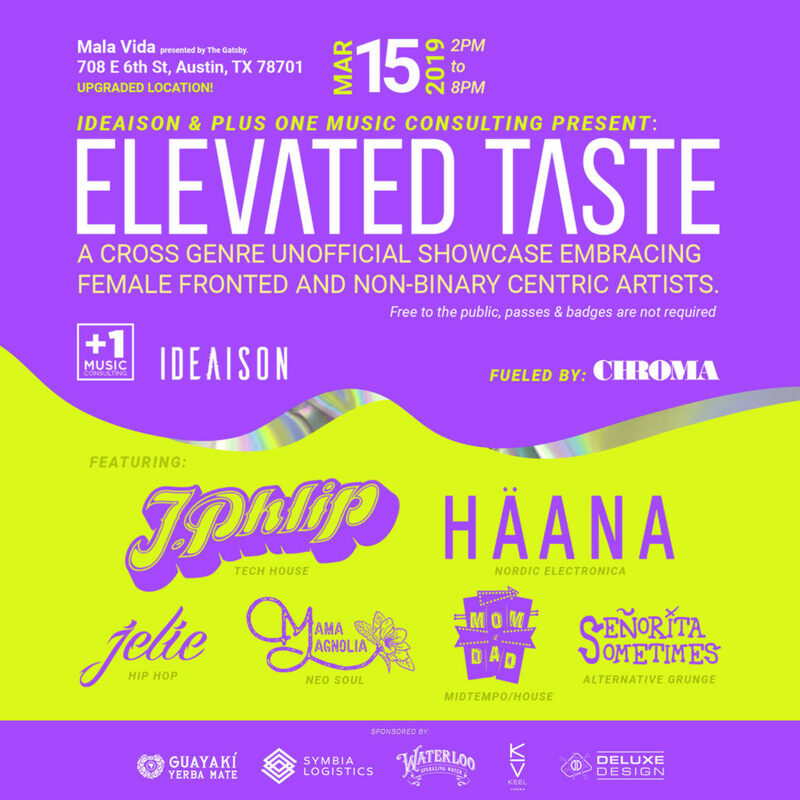 Elevated Taste is the unique coalition of two Colorado woman owned businesses, Ideaison and Plus One Music Consulting, making dreams come true for several artists down in Austin. Curating an all day event showcasing female and nonbinary fronted groups from across the genre board, it was truly inspiring to attend. After hurdling over a few last minute obstacles regarding venue change, Elevated Taste threw an intimate and vibing party at the beautiful Mala Vida, complete with a 15 person marching band that seemed to come out of nowhere. Amidst the insanity of SXSW, I wasn’t able to hang for the full event but the time I did spend there was definitely memorable. From pristine tech house rhythms supplied by world class producer J.Phlip to the mesmerizing downtempo melodies from HAANA, the smorgasboard of genres at this event truly had something for everyone. The patio out back featured clothing vendors, live painters and a CBD booth to engage and educate attendees. After being named ‘Best Band We Saw at SXSW’ by Rolling Stone last year, we knew we had to get our hands on Kansas City based Hembree. Due to their rising status, catching the band at an unofficial showcase would be a rare treat, so I ended up on the East side earlier than planned on Friday afternoon. Warming up with an open bar at Volcom Gardens just across the street, I walked over to Shangri-La to catch the budding band on the patio out back. Their effortless distinct and driven sound is refreshing and immediately addicting, and their dedicated crowd confirmed this further. Singles like ‘Culture’ and ‘Holy Water’ are immediately recognizable and will have you singing along by the time the first chorus hits, proving Hembree will be a living room name in no time. If it hadn’t been for a friend’s introduction, I would’ve never known the goodness I could’ve missed out on. If you have a chance to see them live near you, I urge you to! Their energy is genuine and infectious – Hembree is a band that moves bodies. For more than 20 years …And You Will Know Us By The Trail of the Dead have proven time and time again they’re at the top of the rock n roll food chain, and they happened to originate in this little city of Austin. Brooklyn Bowl’s Family Reunion is one of our favorite parties of South By, so it was already on the agenda for checking out. A solid lineup consisting of White Denim, the Marcus King Band, Ringo Deathstarr, Broken Social Scene and many more, I was stoked to skip the line and enjoy some of these massive acts in such a great venue. I was able to gain a second wind due to the riotous energy supplied by Trail of Dead, and I even joined the pit during some parts. Nothing like a heated performance from one of the best prog rock bands around to win over your Saturday night. 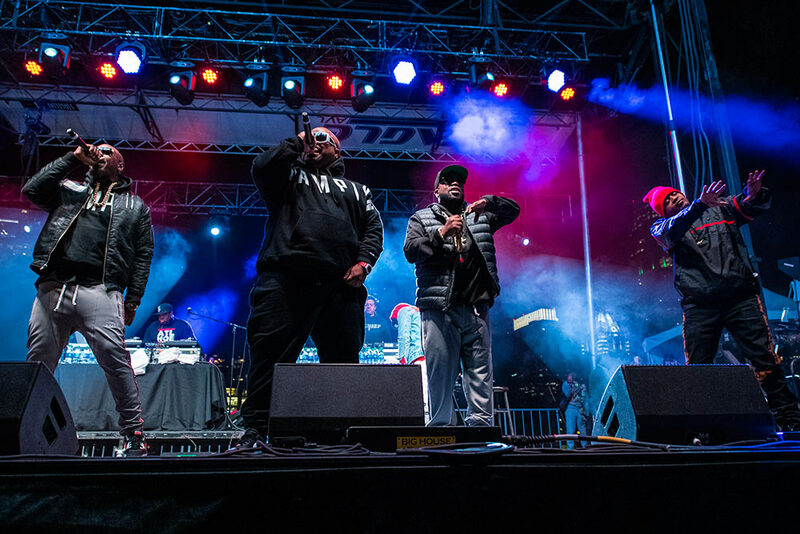 A staple of any South By SouthWest experience involves hitting the free stage at Auditorium Shores, which runs for over 4 days featuring stacked lineups each evening. You’d be hard pressed to find a satisfying amount of good hip-hop with so many rock and electronic acts taking over the city, but there isn’t much more to ask for when you have the opportunity to see Dungeon Family. Austin’s vibrant skyline gave us a breathtaking view for the show, and even better, the sound was on point and crystal clear. Each member put all of their energy into the performance – nearly two hours of fat beats, 90s nostalgia and swift Atlanta rhymes were more than enough to make my night complete. The cherry on top? Cee-Lo Green and Big Boi taking center stage for a scorching lyrical battle that left the entire audience out of breath. Part of the magic keeping SXSW alive is the ability to stumble into random venues without knowing what to expect on stage – most often times it leads to moments of synchronicity that drive the rest of your SXSW experience. This is what happened when I was approached by a young singer promoting her impending performance. Her name was Ivy Roots, and it didn’t take much for her to convince my friends and I to hang around inside. The intimate stage and glowing ambience gave us the perfect atmosphere for her to serenade us for the first time, and it was one of my favorite performances of the week. 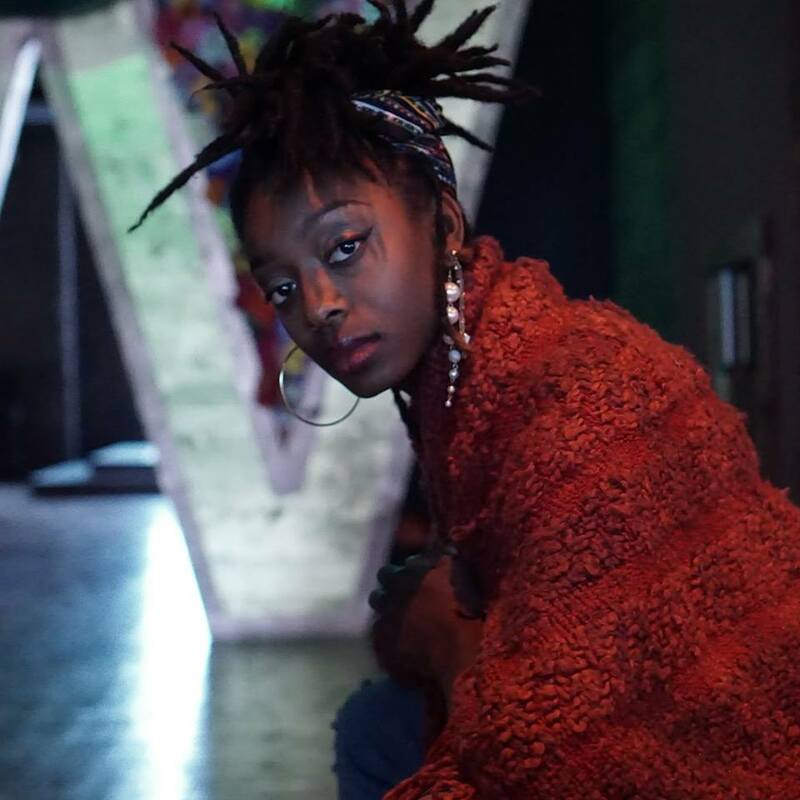 Serving up warm, buttery melodies on her guitar, Ivy’s vocal range was seriously impressive – from smoky and pensive to deep and soul-tingling, Ivy Roots has a uniquely soulful yet rock n roll influenced sound that caught me off guard. Though I’d only caught 30 minutes of her set, it felt like time had stopped inside of Shangri-La. I was captivated by her sound, and I know without a doubt that I wasn’t the only one who became a fan that day – Stay tuned into all things Ivy Roots by following her socials.